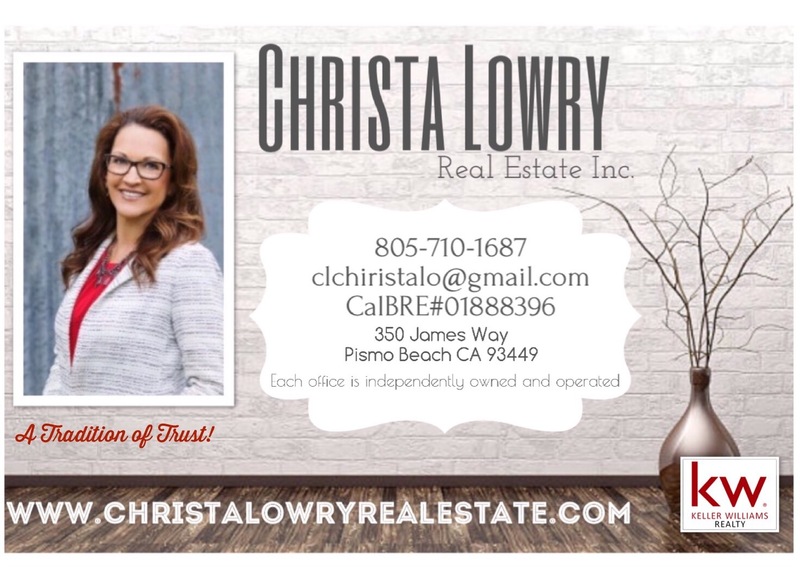 "Christa helped immensely in selling our home in Grover Beach, we knew we needed top dollar for the home to help put that money towards our purchase of a home that she also helped us get. Christa has worked hard and we are very happy with the results of both transactions." 02/20/2015 - tfh256, Sold a Single Family home in 2015 for approximately $550K in Grover Beach, CA. "I recommend Christa Lowry because she does all of the above and more. my wife and I agree she is an ideal agent and will do an outstanding job at whatever she is assigned to do." 01/28/2015 - Robert Scrivano, Bought a Single Family home in 2015 in Arroyo Grande, CA. "We purchased a home that had some unique circumstances with the bank and the neighbor. Christa was very assertive with negotiating and coming up with a solution that was a win-win for all of us. She kept us informed on a regular basis and found us the home that fit our family perfectly. She truly loves what she does." 08/05/2014 - lizinator1, Bought a Single Family home in 2011 for approximately $325K in Grover Beach, CA.